Inspired by Sra. Spanglish, I decided to start our intermediate class today with stations. I had several ideas that I wanted to use, and though we often use stations, this is the first time that I’ve kicked off the year with them. My school disbanded the native speakers classes, so this year’s intermediate class is about 50% hispanohablantes, 50% anglosajones. I need to get a feel for where my students are–some took the novice classes with me, some took them online, some have never taken a Spanish class before–so stations were a good, low stress way of doing some informal assessment and relationship building. Students rotated as they finished each station, and I walked around coaching and troubleshooting–a nice change of pace! We will add a few more stations tomorrow before launching into our first unit. instructions for stations ready to go in frames from IKEA. (Thanks Pinterest! You can download a complete copy of the station instructions for students here. Speaking/interpersonal: From a list of basic interview questions, select several and rehearse them with a partner. Finish by recording the conversation in Sock Puppets or Puppet Pals. Technology time saver: Make/update all the accounts that we will need for the year now. Record usernames and passwords on reminder sheet. Las Pequeñitas: I used a frequency list of the most-used words (the little words like a, por, después, etc.) in Spanish and turned them into a game based on CandyLand that was upcycled from a friend’s basement. 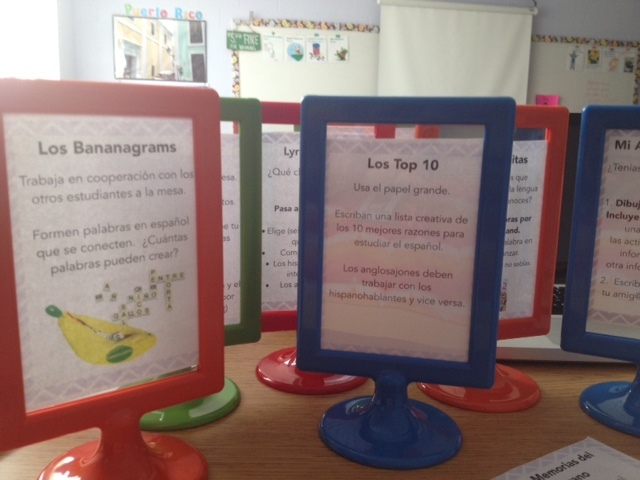 I created a set of cards for the game that had the little words on them in Spanish to replace the cards that came with the game; students needed to be able to explain them in English. Though this is not a type of activity that I use often in class, it had the desired effect: the anglosajones jotted down the Spanish words that they didn’t know, and the hispanohablantes had several questions about the differences between words that they knew, but couldn’t explain, like the difference between me & mi–some students didn’t realize that they were different words. One of my core values for the class is that everyone can learn, and this was an activity that supported that value. The cards are available for download here; the first four pages are color cards with no writing so that they can be adapted for other word sets. All in all, it went pretty well. We had some quirks with technology that were good to work out early on; I also got to work with some kids to calm their nerves about the class as a whole–key to building a program. Last year’s class had 13 students in it; this year’s has 25! I am looking forward to an amazing adventure! 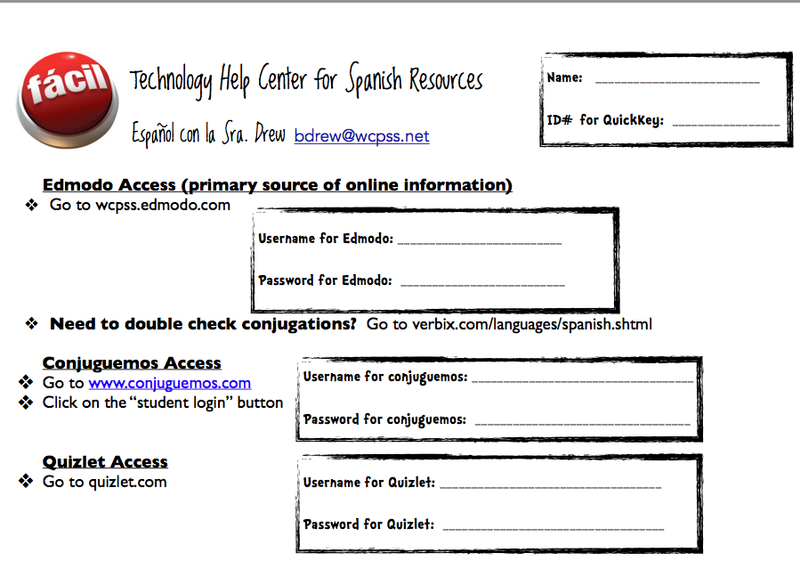 Short, sweet, and simple today, my colleagues: Here is a handout that I use with my students throughout the year to give them a list of sites that we use throughout our classes and their usernames/passwords for those sites. At some point in the first week of school, we have a technology lab and students set up all of their accounts for the year at once. Since I usually have students for at least two levels consecutively, this ends up being quite a time saver from a classroom perspective, and a sanity saver for me so that I don’t have to use my time looking up information and re-setting passwords. I copy them 2 to a page on obnoxiously colored paper so that it’s hard to lose and they put them in their binders. Click here if you would like to see the full document. Happy School-Eve! The countdown to school is on! I’m trying to finish the last season of El Internado before classes start, and yet I feel like I’m going to be moving away from old friends when it’s done! Nonetheless, I continue to learn new things from the show, and here is one (NO spoilers): Cola Cao. It’s a chocolatey mix like Nesquick or Ovaltine, and Fermín mentions it during breakfast service in an episode of season 7. I pay extra attention to what Fermín says because his wit and humor are a class in themselves! In part 1 of this series, I shared uses for two very helpful apps, Remind and QuickKey. Today we will continue the series with two more: PikMe and WordReference. Each of these apps does something unique, and as a package they comprise a very helpful suite of services that make teaching easier. PikMe: PikMe is essentially a random student selector and group generator. While there are many creative tools for creating groups, sometimes I just want a random grouping, and PikMe makes this easy and puts a lot of power at my fingertips. Getting Started: As with other apps, you will need to setup your classes and enter your student rosters to get started, but once that is done you are ready to roll. Choose a class, and then your roster will appear. From there, you can click on an individual student. You can add student photos to replace the generic silhouette. My favorite part of the screen is the stars at the bottom. They mean what you want them to mean, so one of the uses is a discreet way to informally assess students. As they are working on a speaking activity in pairs/groups, I can listen to them and rate their performance. While I use a detailed rubric to evaluate their performance for a grade, this can help me collect data and reminders about who I need to chat with later. There is also an attendance-taking feature. I don’t use it regularly, but it’s a great tool for fire drills! The true beauty of this app, though, is the group maker. 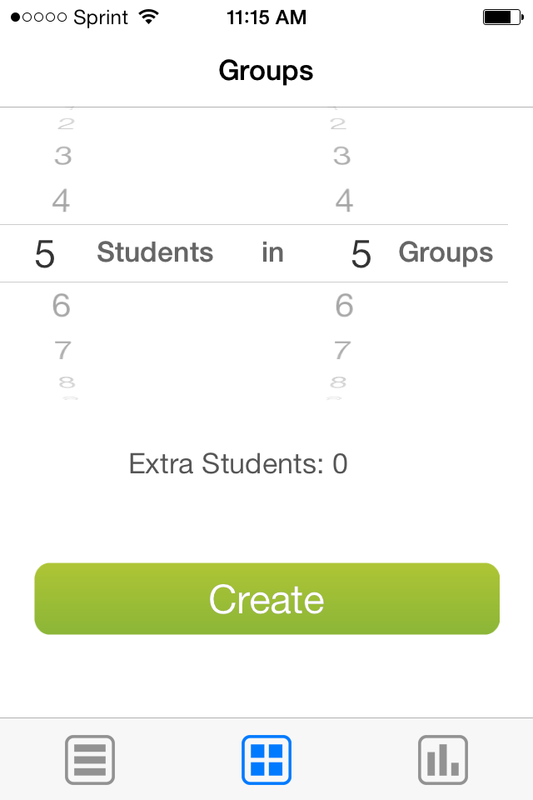 In a matter of seconds, you can create groups based on the number of students or on the number of groups that you need, and the app will separate them for you. You merely “spin” the selection wheel with a swipe of your finger. Extras, as in the 25th student when you have 6 groups of 4, are evenly distributed through the other groups when possible. 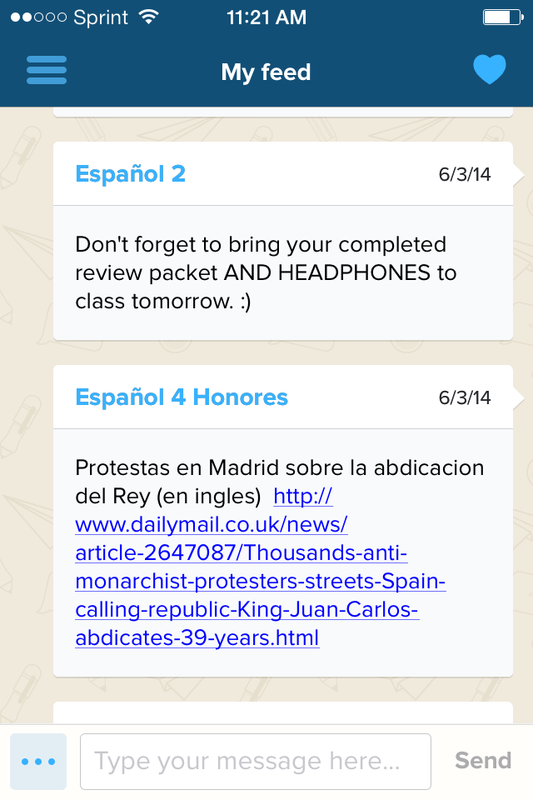 You can also email the list to yourself, which is incredibly helpful for multi-day projects when students were absent. It also makes it easy to display the groups on a projector to limit the “what group am I in?” questions from students. I’ll also take this opportunity to adjust some groups as needed for absences, personalities, and student strengths and weaknesses. The app has a few quirks, but it what it does, it does well. WordReference: Word Reference is a multilingual digital dictionary. Not only does it work as an English/TL dictionary, it also offers Spanish-French and Spanish-Portuguese. I’m a novice French speaker, but often find that the words I look up in Spanish stick with me better than the ones I look up in my native English, so I like that feature. The two aspects that I like best about WR are its availability and its forum. 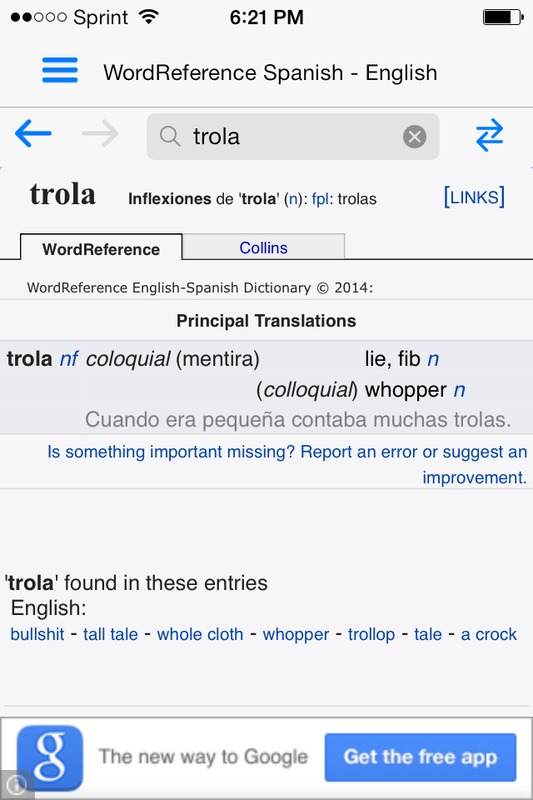 It’s available as an app as well as a web-based site, which makes it possible for every student to have access to a good quality dictionary for free. I teach in a high poverty school, and I like that Word Reference helps to even the playing field for my students. If they don’t have a smartphone, I have paper dictionaries that I can lend them for use at home. But it also means that everyone has quick access to dictionaries as needed both in class and at home. The Spanish edition actually is two dictionaries in one! The greatest benefit of WR for me is the forum section. Once on the entry like the one above, the user can scroll down to see if the sought term has been discussed in the forums. These discussion forums are treasure troves of commentary on idioms, regionalisms, and related terms, and are replete with helpful information. Students have indicated that the forum often has what they wanted to say in the sense that they wanted, rather than having to piece it together or use a translator. As an added bonus, they are even helpful to me as I continue to grow my language skills. I’ve relied on them extensively in the past few months to help me understand El Internado better, especially Fermín’s delightfully witty dialogue. I screen shot the new words, put them in an album on my phone, and then I have a mini-dictionary for reference when the same terms pop up again. By doing this, I’ve discovered a theme in the gaps in my vocabulary–I have added new depth to my vocabulary for being angry, in love, and witty comebacks. Not bad for a free app and a TV show, huh? Stay tuned for part 3 of this series for my favorite app of all: Evernote! Please feel free to share your favorites in the comments. While life on the blog has been pretty quiet, the opposite is true for life away from it. We have had an absolute blast this summer! We were World Cup crazy through June and early July, even going so far as to stream a game on the ESPN app on my phone as we drove through the backwoods of Wisconsin because Argentina was playing. 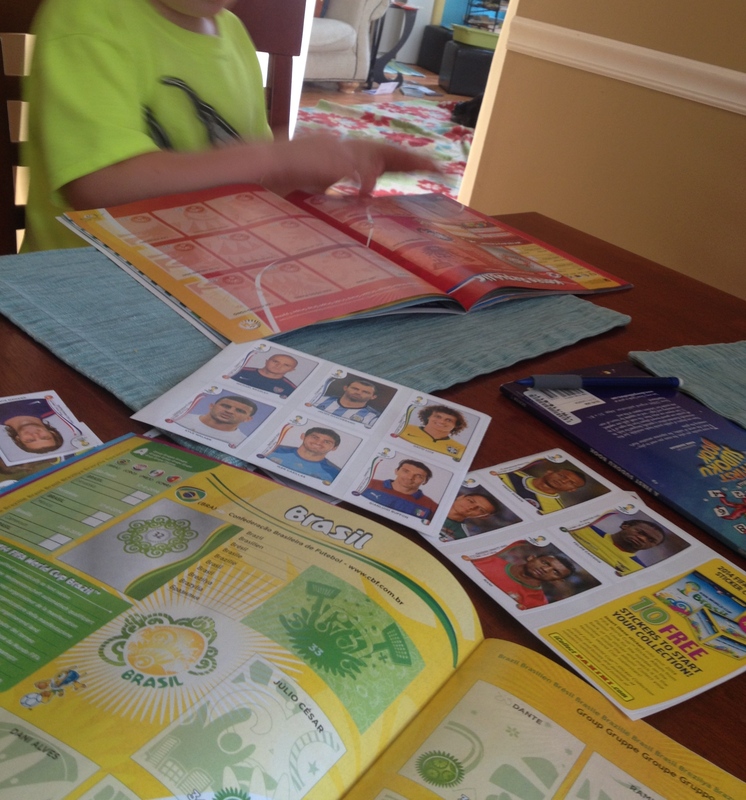 I have the absolute delight of spending significant amounts of time with a sports-crazed 5 year old during the summer, and in addition to watching for Messi’s magic, we have extended World Cup mania through our cromos albums, and they have been amazing for a rainy day activity. Tiny guy’s level of engagement in this activity is what we seek in our classrooms–it’s intense, and it has given me some ideas of how to use this resource in class. We are now trading back and forth (he has an ASTOUNDING memory for what he already has) and are talking about so many things along the way. Where is he from? Where is that country? Is it near the US, or far away? What colors are in his flag? 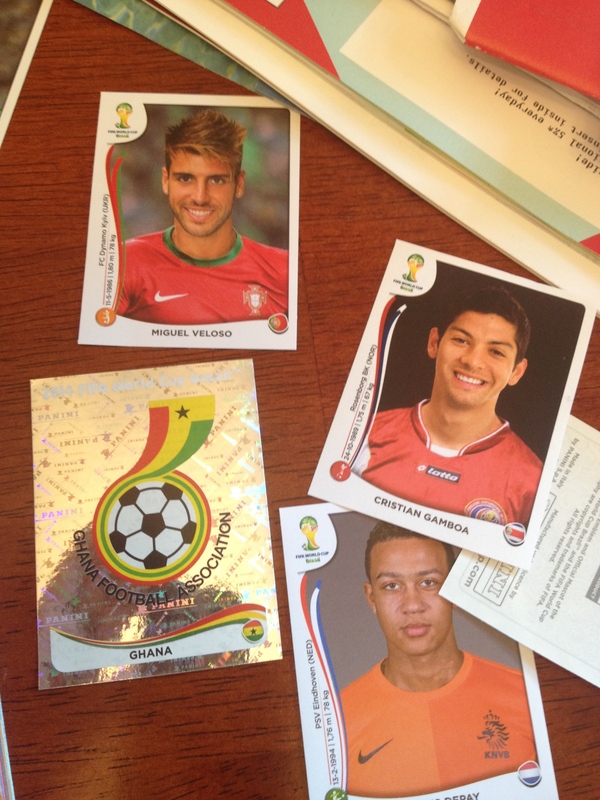 Who is your favorite player? Who is your favorite team? How do you say those things in Spanish? He is fascinated by it, and since it rains almost every day at some point, it has become our go-to activity in the afternoon. Use the extras/duplicates to make mini Guess Who boards with a cultural context to practice basics of physical description and spelling names. Guess Who with names like “Iker Casillas” and “Andrés Iniesta” is inherently more interesting for many kids than made up characters like “Jorge” and “Mario”. Use the collection and articles such as this and videos such as this for reading and listening comprehension practice with rich cultural content. What else can you think of? 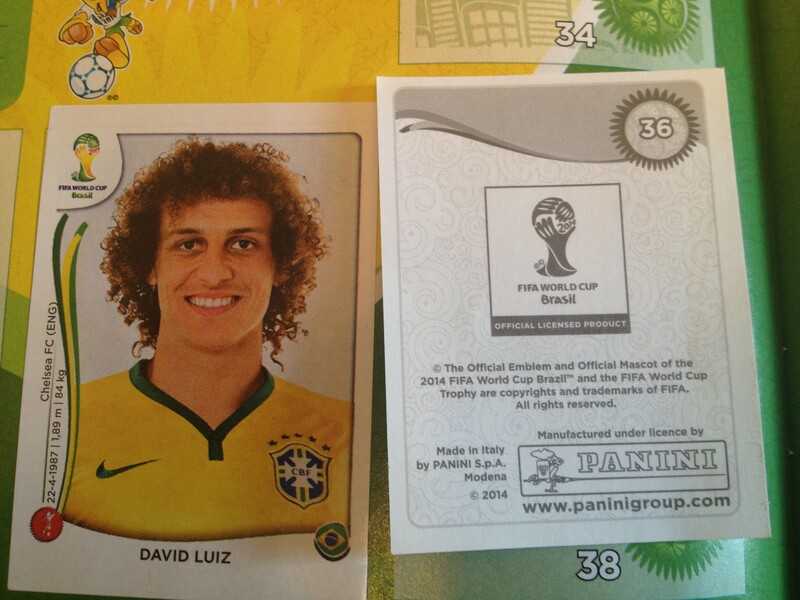 Oh, and can you spare a Messi?